Kefir is Caucasian origin fermented milk product. Kefir is an acidic, slightly foamy product made from pasteurized and fat-standardized or decreamed goat milk that has passed through a combined acidic and alcoholic fermentation of symbiotic lactic acid bacteria and yeast kefir grains. The finished product Kefir, contains 0.6 to 0.8% lactic acid and 0.5 to 1.0% alcohol. Kefir grain includes mix microbial flora. Its size varies between 0,5-3 cm. 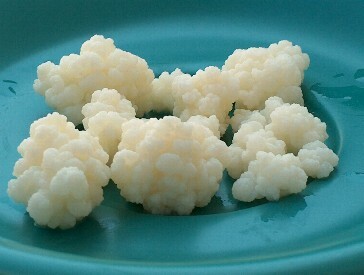 Kefir is white or white-yellow colored, and has pop-corn like appearance. Kefir is easy to digest and help cell growth. Kefir is believed to expend life due to preventing flocculation of materials in intestine. Kefir is rich in protein, fat, lactose and minerals and decrease the bad cholesterol level in blood. Kefir decrease tension, dilute urine, evacuate body toxins, accelerate intestine movement, prevents hepatitis, joint diseases, diarrhea, constipation, blood lost, postpartum problems. It also decrease blood sugar but most importantly prevents cancer. Kefir is an important nutrient for sick people and children, because it is easy to digest and rich in protein. Researches showed that kefir increase potency of people. Woman use it as face-mask. Kefir is also beneficial for nervous problems, anorexia, ulcer, bronchitis and asthma.